Didn't want the day to go by without posting to Theresa's (TexWis Girl) Good Fences meme. I have always loved fences, I used to join Fence Friday's on Flickr before I began blogging. That seemed to inspire me to look for "out of the ordinary" fences each week. So I am happy, happy that Theresa is now my inspiration for fence lookouts. And speaking of happy, happy would ya look at those peonies??!! They are so big and fluffy and multi-petaled they almost look like mums, but mums don't climb fences like these lovelies. I just love your pretty fence here. The flowers sure add to the beauty of the overall photo. You did a great job. really gorgeous blooms! and not a bad fence to grow against. thanks, deanna! This is a gorgeous capture....love it. Lovely Deanna . . . I like the new look . . .
fantastic fence shot and I love the flowers also. Have a good weekend. Oh - so - pretty! I love the angle you used on this photo! Love the new header! That is such a wonderful shot, too! I just love taking pictures of fences, too! You sure found a pretty one, Deanna! 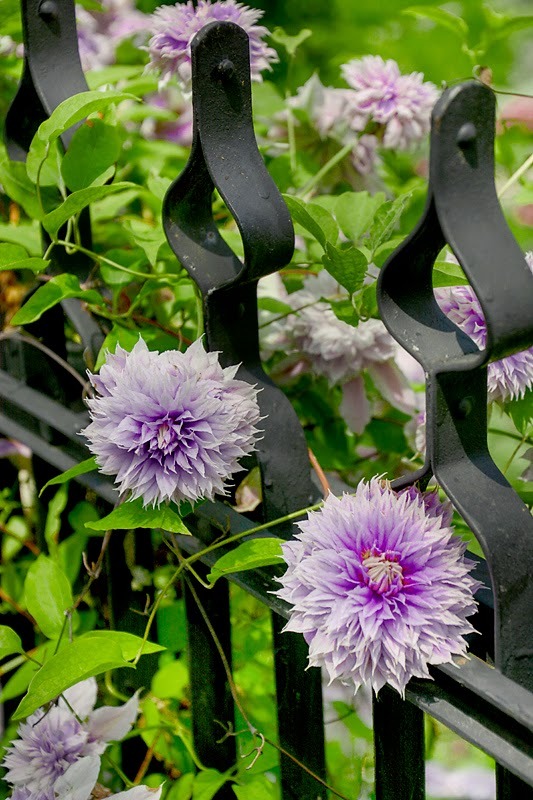 Beautiful image with the flowers poking through the fence openings. This is beautiful but I should tell you the flower is actually a Clematis.